I’m working on a new Art on Call feature for our upcoming exhibition Sharon Lockhart: Pine Flat. Lockhart’s media are film and photography, and she uses them to create an intimate portrait of contemporary rural life as experienced by the youth of Pine Flat, a small town in the foothills of California’s Sierra Nevada Mountains. With the help of the artist’s studio, Art on Call features the children of Pine Flat telling us their stories, revealing the process behind the shoots, and giving an account of what it was like to work with Sharon. To my ear these recordings are magic, nothing profound but a clear reflection of the relationship and trust that developed between artist and subject. In addition to the children of Pine Flat, Art on Call includes Walker director Kathy Halbreich commenting on the installation and personal reflections on the project. 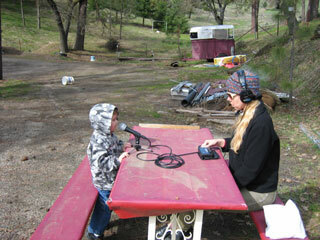 Kathy’s comments in combination with those of the kids make a compelling audio addition to the installation. The stops–which will be posted before the opening on April 23rd–can be downloaded or played online by visiting http://newmedia.walkerart.org/aoc/. To listen on the phone, call 612.374.8200 and enter the code from the list below (look for the files tomorrow or Friday at the latest).